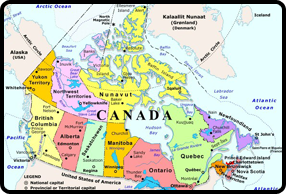 Returning a favour – Leasing power to the NAR Part 1. 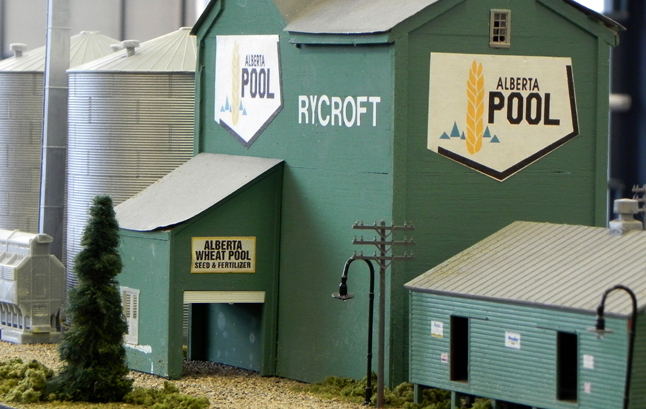 The Rycroft Pool elevator was the towns biggest although they all had their roots in the population expansion during the second decade of the last century. As I left the hotel and walked to the station to meet my hosts I couldn’t help but stop at the side of the elevator and look straight up. The clouds moved overhead and it seemed as though the giant building would come down on top of me. Some things don’t change. I felt that same dizzy feeling then as I did when I was a kid. When I wrote up this What’s New I understood a vast majority of my readers were of the G scale persuasion and that this edition would come as a shock to them. True, I build in 1/29th scale but I never ‘pushed’ any scale. Rather I tried to keep focused on what we could learn from the prototype to make all our models better. 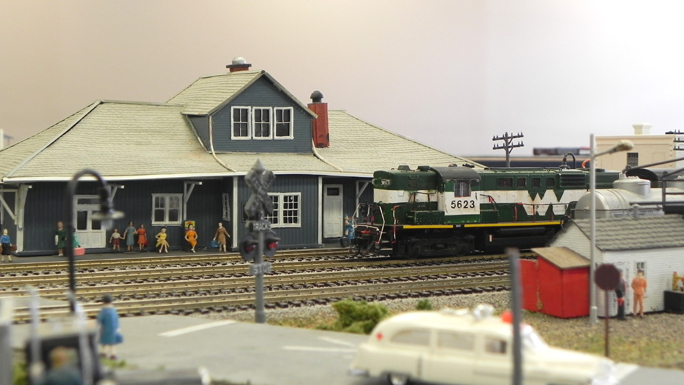 My involvement in a local Free-mo display is an example of that effort. And we did. Sure she was beat up but good looks weren’t part of the deal. She would carry her weight somewhere in an NAR multi-unit lash-up and fill the prairie sky with lots of black Alco smoke as well. Now I would follow her around the subdivision for a day or two and learn a little about their operations. I would start right across the tracks from the station. 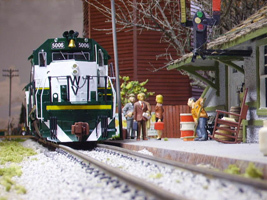 I’ve emphasized this before and I’ll say it again: The thing that makes a model railroad something special is not related to size and complexity, money can do that, or intricate detail and technical gimmickry, both can common and often nerdy, but rather in how you create a realistic, often very unique miniature world. Something true to prototype yet unseen on any other layout. Such is the case with the stations and surrounding buildings on John Green’s beautiful modules. 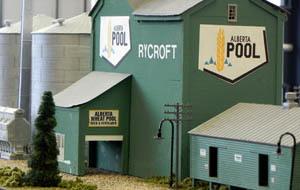 All of the buildings are the result of numerous photo trips to the NAR and were one of the major attractions on his 1400 square foot layout in his home. A fire destroyed that layout but the general public gained from it. Now everyone can see and admire his workmanship. 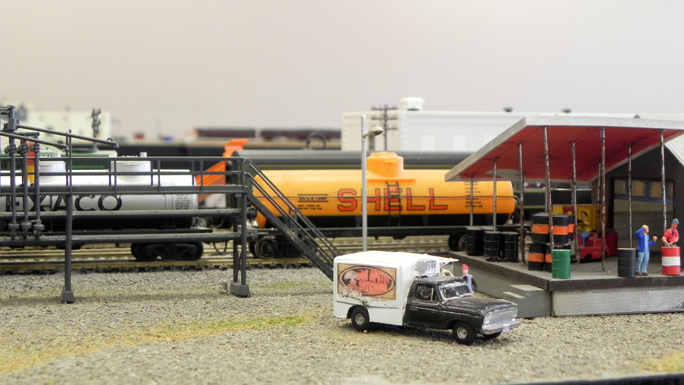 There was a lot of activity over at the fuel distributors siding. This business was one of their power eaters. Every year, during the late summer, Rycroft, Spirit River and the area farms get their winter supply of home heating and diesel fuel. This year, due to a power backlog that daisy chained down the line to the bottom feeders, all that fuel is being moved in mid to late September. This was creating a huge strain on all the railways. Even the short lines. Talking to the owner, I found he moved 18 to 20 tanks past these pumps in any other September. This year he moved 6 already; there were three in dock now and 26 more were on the way. My concern was that my fast-fix RS10 would hang in there for the duration of this exchange. When I took up model railroading back in the 70’s I knew I wanted to build my own structures rather than buy ‘off the shelf’ kits and finished buildings. 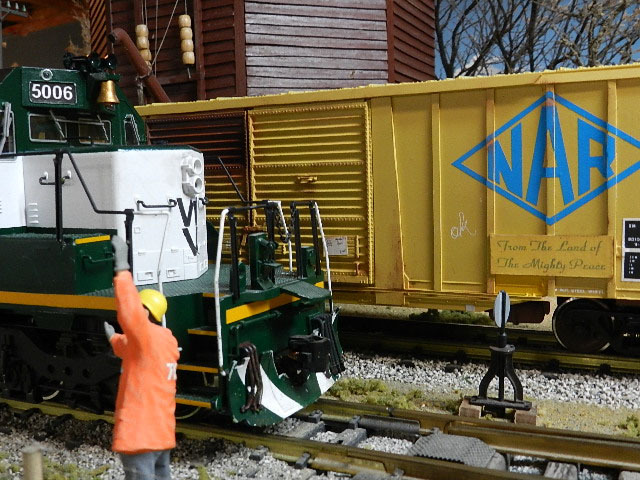 This was as much a result of my wanting to recreate what I saw around me as it was that in N scale at any rate, there was nearly nothing available with a North American look. 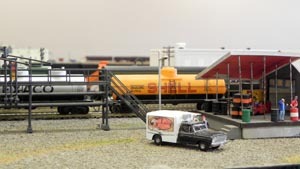 The first thing I tried to do was build a fuel and home heating oil distribution facility just like the one in Cold Lake Alberta. My balsa wood and paper clip effort looked pretty good to me but it really wasn’t of course. My second try was better though. 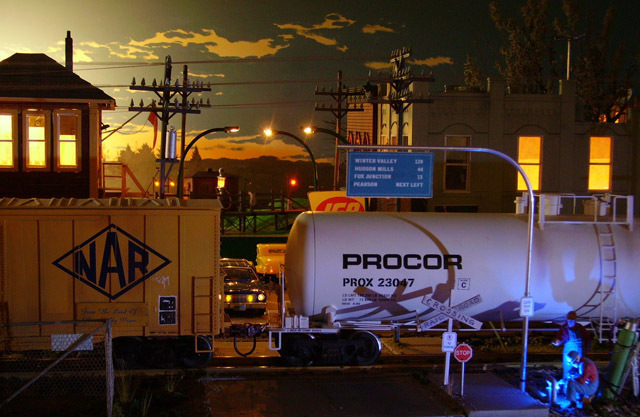 The same business in Kapuskasing Ontario was built on a hillside with the tracks located above the building and the road traffic below. That turned out much better using styrene sheets and brass rods. So, a part of this trip was educational. It would make my job easier down the road. A part of it was personal. There was a wish I wanted to fulfill. And part of it was business. The business part was spending some time over at Max’s Decommissioning. They were tearing apart an old GP9 over there, “old’ being a relative term. Our own fleet of 9’s were older that what the NAR were cutting up. When I was there the long hood had already been cut up. The engine and generator though were still intact as Max showed me around. 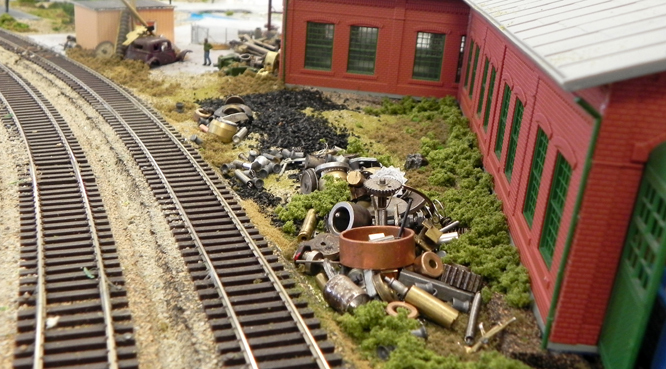 Todays work involved removing some small parts to a tourist driven short line in California. I was not so sure that tourist railroads would ever become popular but bless them for trying anyway. Some of the larger parts were being sorted, weighed, loaded in a gondola and sent to a scrap dealer. The heavy crane impressed me most. We could have used one in Grande Prairie. No. I didn’t find what I was looking for but evidently there had been some nearly new bearings removed from an earlier job and they were already over at the scrap shop. If I hurried they might still be on a shelf somewhere. 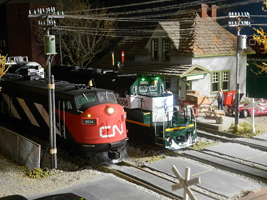 I model a shortline railway of CN heritage. It’s a long way from another railroad (apart from the CN) and even farther from some international frontier. Still, I keep a few special cars with foreign road names on a handy shelf. Mostly common cars I really like (colour, size, lettering) and nearly nothing to do with where they were from or what they were used for. These few cars give me a connection to the world that makes my railroad work. 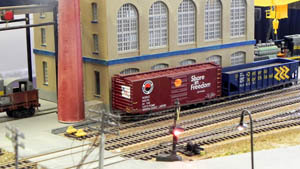 In this picture the online industry at our Free-mo display has spotted a Ontario Northern gondola for heavy parts that will be shipped, in the weather, to eastern Canada and a boxcar being returned to the USA with smaller, more critical parts for a California tourist train operation. Both of these cars give the layout a life beyond the room. There wasn’t much to like about Arnolds place. I expect that in the beginning he had scrap of various kinds moved into the plant, broken down, separated into shipments and moved cleanly out to buyers. But, over time, parts with no immediate use were ‘stored’ outside. That storage soon became useless, unrecognizable piles of trash overgrown with what ever managed put down roots. That’s how I found it today. Much to my surprise though Arnold knew where everything was and it didn’t take him long to sort through the junk and locate the bearings I was looking for. What’s more the cost was reasonable and they could be shipped out the next morning. So just that quickly I accomplished all I had expected to accomplish, business wise. A carefree supper was in order and my plans for tomorrow were starting to come together nicely. Believe it! This was the case of me not having enough junk. How many can say that? Max supplied the lovely metal trash. It’s simply amazing what he’s collected in that workshop of his so I spent an hour over a beer and went through drawers of ‘stuff’ looking for small items that would pass as big ones. The variety of colour is just about right without any enhancing of any kind. Glued it all down and covered it just a little with weeds and coal. Back last September I’d made up my mind to visit my namesake village out in northeastern Saskatchewan and to carefully photograph all the important structures. It became a goal after finding the town of Winter in timetables going back as far as the first CNoR and GTW entries. The pictures themselves were for my ‘family history’ album. I’d made myself a bit of a hobby doing this so the trip became quite important. Being the oldest child and all that. My plan was to follow the CN main line east and about half way down the Wainwright sub, turn south on grid road 657, and find a siding that was home to 200 prairie pioneers but I arrived to a bushy, sand dune filled wasteland surrounding a large, out of place stone and a plaque. The marker paid homage to the people who built their first store and Post Office in this place back in 1910. Evidently, an elevator and a large lumberyard followed in 1920. The Grand Trunk Railway even built them a new station in 1925 but that building closed in 1968 leaving nothing but a grassy field along with the original sign from the depot that was once the heart of the community. 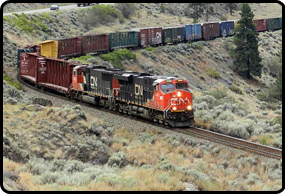 A while back, in some publication somewhere, I described my photo trip to the CN main line between Wainwright AB and Biggar SK. It was back in September 2009 anyway. 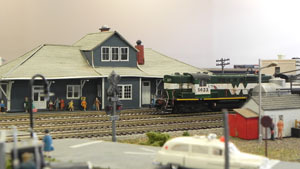 The timeframe and rough location of my own layout. One vital stop along the way then was to my namesake town and of course the basis for Winter Valley – town and railroad. On ‘The Alphabet Railroad’ deep in the bush between siding of Yonker and the village of Vera, west of Unity, was the ghost town of Winter. The Energy, Mines and Resources, 1:50,000 geographic survey map 73C`12 shows 5 buildings on the site. There is only one. And a well placed plaque on a small rise between grid road 657 and the foundations that once supported the main street. Fact is, only one building remained in Winter Saskatchewan and if there ever was a little house on the prairie, this had to be it. The single story home showed both the ravages of time and a family’s hope for the future. 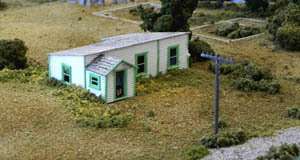 The simple building had a bedroom and a kitchen/family room. Children’s artwork could still be seen on the baseboards. The mudroom extension on the front must have kept out the worst of the dirt in summer and the worst of the cold in the winter. It remained a sad testament to “giving it a try” and made me stop and think about all we take for granted these days. It was a sad thing. The concrete foundations. The rusting bed springs. The stoves and pots and pans in the fields. I couldn’t help taking a last look in the mirror when I turned and headed back up the dusty road into 1975. The single structure was not an architectural treasure but easy to add to my Free-mo corner module. I had no HO buildings and didn’t want to start buying any so scratch building this lone house on my ‘ghost town’ would be both easy and original. The rest would be a few low, rolling hills, a main street of cement foundations, some of them overgrown with stunted trees and a selection of Woodland Scenics material. 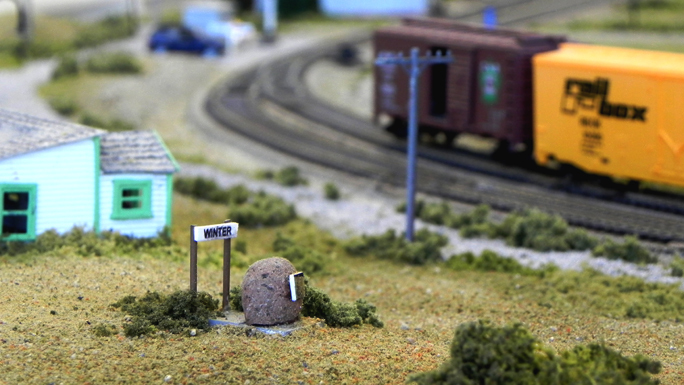 A cheap box of utility poles, properly weathered, some fine sifted sand for roads and a curved turnout. I needed a drink. The Indian summers day had been long and hot. The results of my visit to Winter had been moving in an uncomfortable way. Where were they all now? Did the children ever return? I couldn’t know and didn’t have time to find out. Tomorrow would be busy again. What the Hell. A brewery tour. A few cold ones. Meet some of the locals. What’s wrong with that anyway? There is an ongoing battle between myself and the dozen or so members of the local club. I do the scenery on these modules, and the club layout, so I usually get my way – to start – but the war goes on. I say, “Look outside. How many multiple ambulance car accidents do you see? How many fire trucks and 1987 Firebird convertibles are on main street? How many cement trucks can park in front of how many fast food joints? Can we please get real here?” But no!